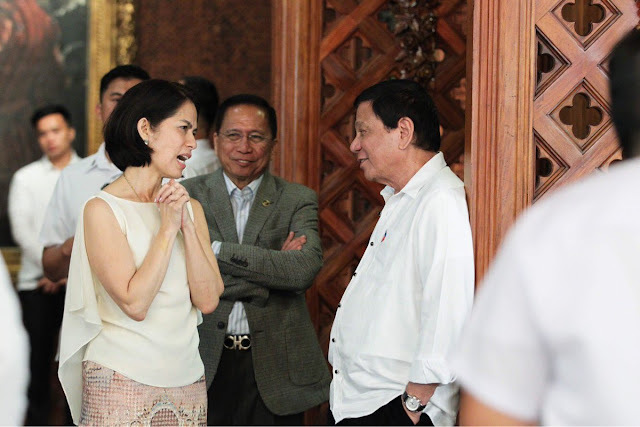 MANILA - An anti-crime watchdog on Thursday urged President Rodrigo Duterte to let outgoing Secretary Gina Lopez continue her campaign against destructive mining in an official capacity, after she was rejected by the Commission on Appointments (CA). "Mananawagan kami kay Presidente na bilang Chief Executive... na paano po mare-retain si Gina. I don't know how she can continue on with this fight na fight din ni Presidente," Dante Jimenez, founding chairman of the Volunteers Against Crime and Corruption (VACC), said in an interview with radio DZMM. During her time as environment chief, Lopez angered the mining industry after ordering the closure of 22 of the Philippines' 41 mines in February to protect water resources in the world's top nickel ore exporter. She then cancelled dozens of contracts for undeveloped mines and, just last week, banned future open-pit mining projects as she tightened her crackdown of a sector she blames for extensive environmental damage. On Wednesday, 16 members of the CA -- enough to constitute a majority -- voted against Lopez' appointment to Duterte's Cabinet. It was not clear how many voted in favor or if there were abstentions. Jimenez said he will meet with non-government groups about CA's decision, which he said was influenced by business interests. "Mananawagan ako sa iba't ibang grupo -- mga NGOs, even individuals -- na magkita-kita kami tungkol po dito dahil mukhang umiral po dito ang kasamaan. Nanalo, nanaig ang mga swapang, greedy na private corporations," he said. Lopez is the second appointee of President Duterte to get rejected by the bicameral body. The CA earlier thumbed down the appointment of Perfecto Yasay Jr., the President's pick for Foreign Secretary, due to citizenship issues.